For the past 8 years, Piggy Paint'ªs mission has been to create; non-toxic, premium products. Products that are worry-free and completely safe for kids. With an ethical, eco-minded vision, their company strives to offer the most natural nail polish on the planet. An advanced, water-based formula that is better than 3 free, better than 5, 7, or 10 free 'Ò it'ªs free of ALL harsh chemicals! "Sleepover" is a midnight black. Non-toxic nail polishes, that are great as a learning tool for your children. Dries to a hard, durable finish - no peeling. Apply 2 -3 thin coats of Piggy Paint. For best wear.. Blow dry polished nails for 1 minute with hair dryer set on warm, heat/low blower setting. Use Piggy Paint Basecoat for extended wear and Topcoat for added shine. Singing songs to pass the time. Make 'ÏPiggy Painting' a bonding experience for you and your child. If thinning is needed, add 1 or 2 drops of water. 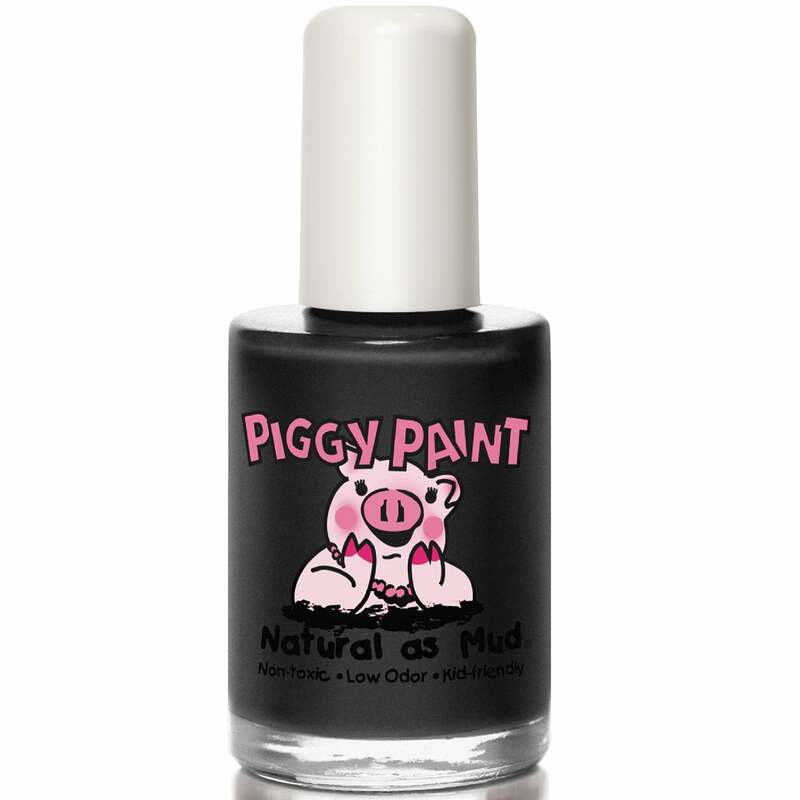 Piggy Paint Nail Polish is only intended for use on fingernails and toenails. Melanie Hurley, founder of Piggy Paint. A mum of two girls, who love to have their fingernails painted. She has always hated the thought of her children putting their hands in their mouths after she had painted their nails with traditional kid polishes. Not only did the ingestion of the chemicals worry her, but the smell nearly left her light-headed after painting two sets of fingernails and toenails. One day whilst they were painting nails over a foam plate, her daughter dropped a glob of her solvent-based polish onto the plate. Shortly after, the paint began to bubble and 'Ïate' through the plate. She looked in dismay at the hole in the plate and decided to test all of her other 'Ïkid' polishes on the foam. Within minutes, ALL of the solvent-based polishes began to bubble and eventually left big holes in the plate. From that day on, Melanie decided that any flammable substance that could eat through foam was unacceptable for her children'ªs fingernails, which would inevitably end up in their mouths. Her quest was on, and Piggy Paint was born. As you may have guessed, their polish is NOT flammable and sits beautifully on the unaffected foam. Enjoy this water-based polish that is specially formulated of natural ingredients. Finally, a kid-friendly polish without the accompanying drawbacks of traditional polishes. From their heart to yours, they hope Piggy Paint takes the worry out of painting your nails and puts the fun back into this enjoyable activity you can share with your daughter and other precious girls in your life. Say good-bye to harsh, smelly chemicals and hello toÊPiggy Paint.. it'ªs as Natural as Mud!